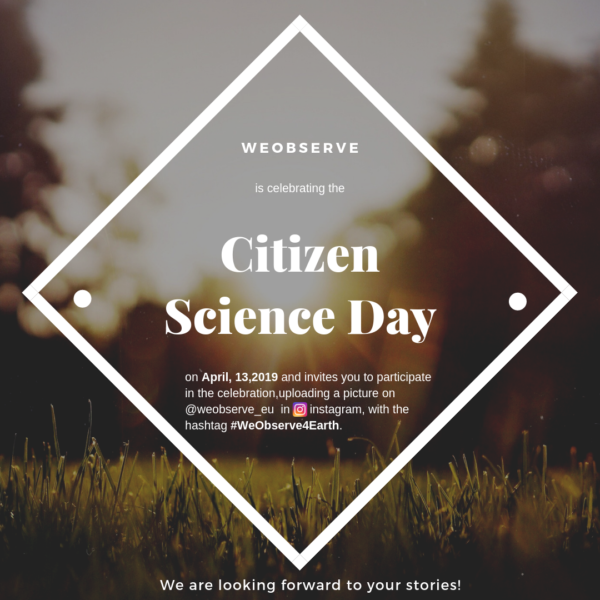 WeObserve celebrates the Citizen Science Day, on April, 13, 2019 and invites you to take part in the celebration.Citizen Science is an opportunity for all people, from all ages, to collect, share or analyze data to help scientists address local or global questions. There are many initiatives and much more ways to get involved. WeObserve encourages you to participate and turn into being a researcher even for one day. We invite you to celebrate together the citizen science day by uploading an image from your citizen science experience to @weobserve_eu account on Instagram with the hashtag #WeObserve4Earth. For more information about the campaign or the WeObserve project, visit our website, join our social media or reach us via an email. And don’t miss to subscribe in our newsletter here so as to stay up-to-date. Help WeObserve create the biggest citizen science community!